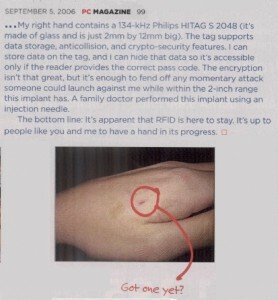 I was searching for some specs on the new EM4102 replacement chipset and came across an image of my hand and some text from a PC Magazine article published Sept 6th, 2006 on a rant & rave site dedicated to bringing down “big RFID”. The caption on the site said “Mark of the Beast”, but the image used is my left hand… even though in the text I’m talking about my right hand. The funny thing is, I never did an interview with PC Magazine… I guess it must have been Reuters or some other outfit that sold interview content to them. Odd seeing images of myself in publications I had no idea were even writing articles. I know for sure they didn’t get permission to use the image, which bums me out a little. Not because I’m all high and mighty on the copyright issue, but I simply would have wanted to know there was an article coming out… I would have picked up a copy! I’m curious as to what the rest of the article said. Also, I had no idea one of my book chapters was up on PCmag.com… probably a promotional thing Wiley put together. ExtremeTech also has the same chapter content, but I do remember Wiley contacting me about that one. This entry was posted on Sunday, October 4th, 2009 at 3:55 pm	and is filed under Adventures in RFID. You can follow any responses to this entry through the RSS 2.0 feed. You can leave a response, or trackback from your own site.